Precision cut Hardwood Optical Cases & Hardwood Optics Boxes for storage of all eSource Optical components are available in a variety of standard sizes. 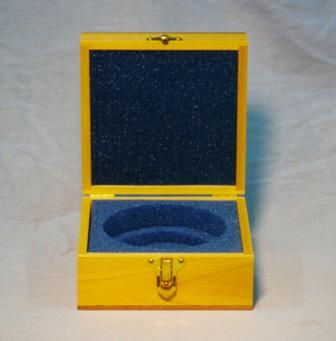 All wooden optical cases & wooden optics boxes are made of hardwood with foam inserts, hinged tops and a latched front. Each wooden optical case & optics box is polyurethane coated with a clear, non-toxic and environmentally safe finish to seal out moisture and particles. Our Window, Lens & Filter Optical Cases & Optics Boxes are used as protective wooden storage cases for packaging of multiple optical components or a single optical component. Multiple Optical Component Hardwood Optics Cases are available to hold 1/2", 1" or 2" size diameter or square Windows, Lenses, Filters or other Optics in quantities of 6, 12, or 24 components. Single Optical Component Hardwood Optics Boxes are also available to hold one 2" to 8" diameter Window, Lens, Filter or other Optical Component. Please refer to both types of Hardwood Optics Cases & Boxes below. Accessories such as handles, rubber feet, etc, are available upon request. eSource Optics will also supply any custom size Hardwood optical case or optics box with foam insert to your specific requirements. Please contact us at Sales@eSourceOptics.com with any questions or with your custom Hardwood Optical case or optics box requirements. eSource Optics offers the lowest prices possible yet maintains the highest quality Hardwood Optical Cases & Optics Boxes for all of our high quality Optical Components. Multiple Component Hardwood Optical Cases listed below hold multiple optical components of 12.7mm (1/2"), 25.4mm (1") or 50.8mm (2") Diameter or Square Windows, Lenses, Filters & other optics. All wooden optical cases are lined with pre-cut foam. Dimensions listed are approximate Inside L x W wooden optical case dimensions. Single Component Hardwood Optics Boxes listed below hold One 25.4mm (1") up to 254.0mm (10") Diameter Window, Lens, Filter or other Optical Component. All wooden optics boxes are lined with pre-cut foam. Dimensions listed are Inside optics box dimensions. Standard wooden optics box Inside dimensions are based on an Optic having a 25.4mm (1") maximum Thickness. Availability: eSource Optics Hardwood Optics Cases & Boxes are supplied on a per order basis; lead-time is typically within ~2 weeks. 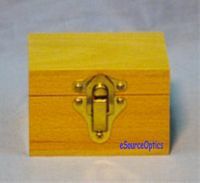 Need a custom size Hardwood Optical Case or Optics Box?